There are two types of insomnia: acute and chronic. The difference depends on the regularity and duration of insomnia. Acute insomnia is relatively brief, lasting a few days to a few weeks. Chronic insomnia lasts at least three nights a week for more than a month. There’s primary insomnia, where there is no known underlying cause of the sleep disturbance, and then there’s secondary insomnia, where something is causing it, like stress, poor sleep habits, disruptions in circadian rhythm, a medical condition or medication. Secondary insomnia can be treated by treating the underlying causes. Make sure you’re properly priming yourself for bedtime by turning off screens, dimming the lights and lowering the temperature in the bedroom. If it’s constant travel that keeps you awake, the Inscape app has a Jet Lag meditation to help reset your sleep patterns. 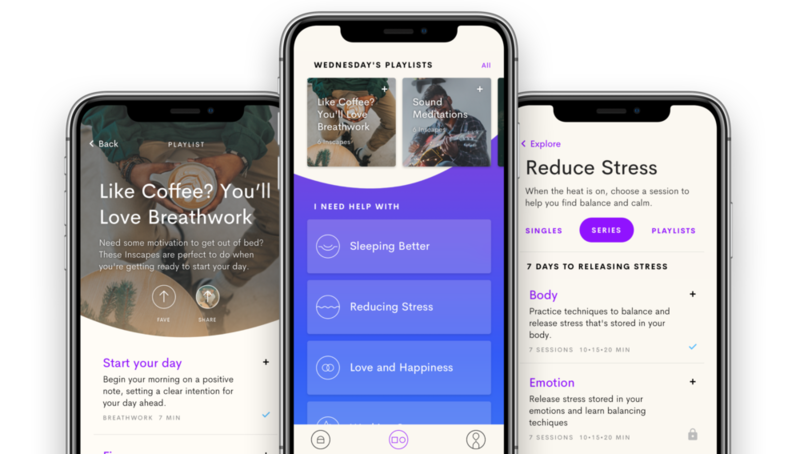 The most common culprit of sleepless nights is stress, which is why there’s an entire series on Healthy Sleep in the app. Do these guided meditations daily and you’ll find insomnia relief in no time. If you’re unsure what’s causing your sleepless nights, give some of these tips a try. Each is known to help promote better sleep. Meditate twice a day. Mindfulness meditation has been shown to fight insomnia and improve sleep. Do it for 10 minutes in the morning and 10 minutes in the evening — every day. Try the Sleep Series in the Inscape app for guided help. Do yoga for 20 minutes a day. Not all yoga styles will help you sleep. Nidra yoga specifically focuses on the breathing and restorative poses that are linked to improved sleep. Try child’s pose, the corpse pose, or placing your legs up on a wall. Exercise for 30 minutes several days a week. Moderate-intensity aerobic activity, along with strength training has been shown to improve sleep quality drastically. Take a magnesium supplement. This mineral is vital when it comes to sleep and relaxation. Studies have shown that magnesium improves the efficiency, quality, duration, and onset of sleep. Take a melatonin supplement. Melatonin is the hormone that controls your sleep/wake cycles. Your body’s natural production is supposed to ramp up at night to signal it’s time for bed, but indoor lighting and screens can disrupt this process. Indulge in a massage. Research indicates massage therapy helps reduce sleep disturbances by boosting the body’s release of melatonin. You don’t need to book a spa treatment though. Try some of these self-massage techniques to relax. Using lavender, marjoram, or neroli essential oils — scents which promote relaxation — begin massaging between your eyebrows with your fingers and move along the ridge of your brow. Then press your ears between your thumb and index finger. Move down to your neck, kneading up and down the front, back, and sides. Next, rub your abdomen in a clockwise direction, then switch to counter-clockwise. Finish with your feet by massaging the arches of the soles in a circular motion. It also helps to concentrate on taking deep breaths and count the number of strokes as you massage.